The crowd-sourced singer will embark on a multi-city American tour this year. The crowd waves neon green glow sticks in the air. The performer they came to see is loading on a screen. After a kaleidoscopic burst of magic dust, Hatsune Miku, one of Japan's preeminent pop stars, appears on stage. As she breaks into a song-and-dance routine, her long aqua-colored pigtails brush her ankles. The thunderous roar inside New York's Hammerstein Ballroom is for an artist who doesn't exist. She's a computer-generated virtual singer projected on a screen. Miku is a 16-year-old pop star who never ages. She has neither a physical presence nor a voice of her own. She's a 3D animation that personifies a "Vocaloid," a form of software that synthesizes vocals from a pre-recorded voice bank to mimic human singing. So when the fans reacted to Miku's 3D projected performance in New York, part of her first American tour in 2014, they were hearing modulations of anime voice actor Saki Fujita's vocals. Even before Miku made her way to the United States, she was a popular phenomenon in the online Vocaloid community. She performed in packed arenas in Japan, but it wasn't until she opened for Lady Gaga at Madison Square Garden in 2014 and showed up on David Letterman's Late Show later that year that she made her simulated presence felt in the States. Even though the iconic English virtual band Gorillaz had been sweeping award shows and performing sold out concerts in the country since the early 2000s, anime-inspired Miku still seemed like a novel concept.​ But now, as she makes her way back for a tour in April, things look different. The crowd-sourced pop star will be covering more ground across the country, performing in six cities that have been carefully selected based on the density of her American fan following. Unlike human pop stars who work with producers and record labels to hone their artistic voice and genre, Miku is the creation of fans who actively participate in her existence. When Crypton Future Media, the Sapporo, Japan-based music software company, introduced the virtual singing software in 2007, it made the program and her virtual avatar open and accessible to anyone who wanted to create their own Miku. "All of Hatsune Miku's music is written by fans," says Amy Fineshriber, a 21-year-old American artist based in Japan, who was recently commissioned to illustrate Miku for Crypton Future Media's American Expo campaign videos. "A lot of pop stars have teams that write their music, control their look and plan concerts. They have an artificial personality created by an industry whereas Miku is created by the fans. While her songs aren't her own, they don't belong to the company either." So a fan in one part of the world comes up with a melody while another adds the instruments or tweaks the rhythm. And the collaboration doesn't stop with the music. 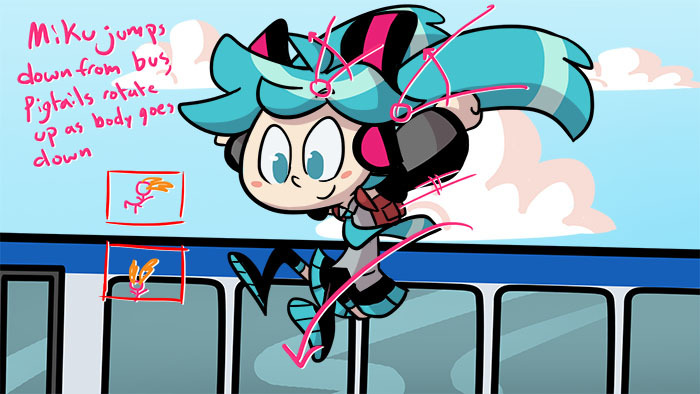 Some fans prefer to change her appearance through illustrations in Photoshop while others work with Miku Miku Dance, a dedicated dance-movement-generating software, to choreograph her moves. 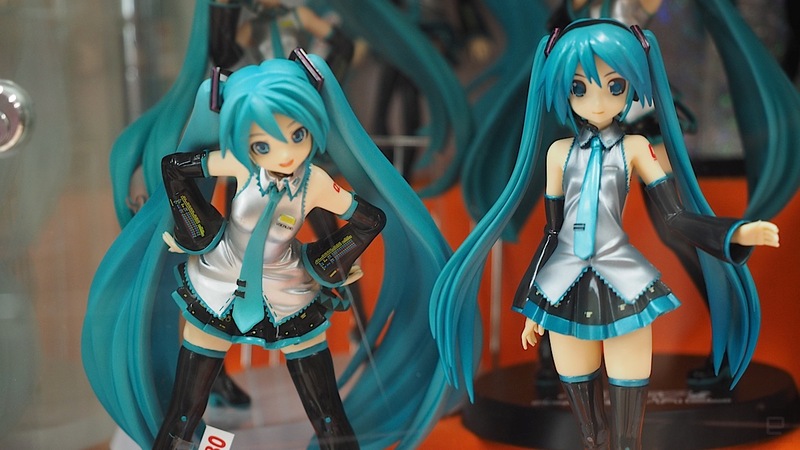 "Miku is nothing more, officially, than a voice and a design," Fineshriber says. "With those things you can create whatever you want. She's positioned as a digital pop star, but in a larger sense, she's a creative hub. A lot of people who create all sorts of genres and styles can use Miku as a common ground to find each other's work. She's more of a community than a thing." It takes a digital village to create this open-source pop star. The community, which started to take shape around the launch of the synthesizing software in 2007, is now a well-oiled Vocaloid song machine. A quick "Hatsune Miku" search on YouTube yields close to two million results. The virtual star's fan-made body of work includes sing-along J-pop songs, heartbreaking ballads and heavy metal tracks. The freedom to create any kind of Miku has made her a genre-defying artist with a massive catalog of music (more than 100,000 songs have been created). It's led to her success and an ever-growing fan following. But it's also sparked careers for young artists. Supercell, for instance, a popular 11-member Japanese pop outfit, started out making songs using the Miku vocaloid before being signed to Sony Music Entertainment Japan in 2009. They went on to sell tens of thousands of original records. "Miku is really a gateway for music," says Matthew Farnham aka CircusP, a 20-year-old aspiring producer from Maine, who recently won a Miku song contest. "She gives a voice to a lot of people who would otherwise have none. I was definitely just a fan at first, but I was inspired seeing people I know use Vocaloid to create music. I thought, 'Hey, maybe I could do something with this as well.'" This sense of inclusiveness and mass collaboration was the reason Crypton Future Media first introduced Miku. In 1995, the company was already selling computer-programmed sound effects to professional musicians and broadcasters, but it wasn't until 2004, a year after Yamaha developed the Vocaloid application, that the company started experimenting with human-voice-synthesizing technology. Replicating thumping beats and hummable melodies was already perfected by then, but making a computer sing like a human was revolutionary at the time. Crypton Future Media's first Vocaloid, Meiko, was aimed at professional musicians. The software came in a box with the illustration of a short-haired brunette who wore a red crop top with a matching skirt and elbow-length black gloves. A few years later, the company introduced a male Vocaloid named Kaito. Despite his stylized image -- the brooding figure wore a long white coat, his deep blue hair matched a long flowing scarf and knee-high boots -- the application failed to make a mark. According to the company, a combination of bad marketing and timing led to its mediocrity. But in 2007, the introduction of anime-inspired Miku changed the fate of Vocaloids. Unlike previous iterations, Miku went from being a software program to a pop star. She was released with a suggested tempo (70 to 150 beats per minute) and music range (A3-E5), but she was more than a voice synthesizer. This time Crypton Future Media built a persona with human attributes instead of just an illustration to go with the software. It was also the first Vocaloid that was available to amateur musicians and fans outside the confines of a professional community. When Miku made her debut, she was about five feet tall and weighed about 90 pounds. Both attributes, along with her age, have stayed the same, but the rest is constantly recreated. In her first appearance, on the box, she wore a black ruffled skirt and a silver-grey sleeveless button down shirt with a tie that matched the color of her hair. Although that image has since become iconic and often feeds the culture of cosplaying around her, fans tend to take liberties with illustration styles and outfits. Zatsune Miku, for instance, is considered a twisted twin in an unofficial fan community. In this sinister spin, the repurposed avatar wears all black and her skirt hem is frayed. Her hair is black but it shows a hint of dark turquoise so she still looks related to the original Miku. Straying from a persona that's been carefully constructed by a record label can be bad news for a young pop star. But not for Miku. Crypton Future Media developers planned on the open-endedness -- they wanted fans to give her a backstory and a personality that resonated with them -- but the company didn't foresee this kind of success. Around 40,000 copies were sold within the first year alone. "It coincided with the rise of YouTube and Niko Niko Douga [the Japanese equivalent of Youtube]," says Guillaume Devigne, the company's overseas representative for global marketing. "People would make songs with that software and when they wanted to share it, it was best to put it on those sites. That gave a lot of visibility to the voice but also to the character itself." Miku's widespread visibility on video streaming sites has made her an icon and led to a wide range of popular video games, iconic performances and some bizarre commercials. But every now and then, Miku breaks out of the World Wide Web to perform in the real world for her fans. The concerts keep her stardom going. For live shows, an in-person band accompanies Miku on stage. Despite the fact that their lead singer is a 3D projection, the musicians follow her cues and timing as they would for a human artist. A dedicated team at Crypton Future Media picks the songs for the concerts. The songs that are most popular with the fans and have the right rhythm for choreography usually make the cut. "It's like any other artist," says Devigne. "But it's different from having an album and turning that into the concert. We don't have songs made especially for the concert." The choreography isn't new either. The company motion captures dancers who are brought in to perform the dance moves that are already associated with a song on the Internet. "It's almost as important as the lyrics for many fans," he says. "They learn the moves and produce videos of themselves, so the choreography becomes a very important part of the song." Miku's creative success can be credited to her tens of thousands of fans that participate in her existence. This unique level of accessibility is made possible with an equally unique licensing model. To open source the Vocaloid, Crypton Future Media set up Piapro, a website dedicated to Miku (and other official Vocaloid) illustrations. The site is run under a Piapro Character License, where the company retains commercial rights but creators and fans can use an image with little oversight for noncommercial activity. The license also allows the company to crack down on variations – violent or pornographic avatars, for instance – that exploit the image of their star. Every variation isn't taken down, though. On the internet where exploitative ideas tend to thrive, unofficial versions of Miku can still be found. But that doesn't faze the company. Crypton Future Media stays focused on their product and its official persona that allows them to take on live tours across America, which can be daunting even for a human star. Miku's popularity overseas isn't a cause for concern either. As she starts to engage with a newer audience in foreign markets, where Vocaloid musicians are still an alien concept, she runs the risk of being misunderstood. Her authenticity and corporate upbringing are often called into question on forums, but the fans who created her from scratch tend to disagree. Her two upcoming shows in Mexico are already sold out. A Vocaloid like Miku also incites the same fear that other robotic inventions do: Will the digitized singing sensation become the overlord? But the company often points out, Miku isn't designed to replace human voices. Even at her best, she can only imitate them. "I think its charm lies in the imperfectness," Hiroyuki Ito, president of Crypton Future Media said in an interview. "Sometimes sounding really machine-like adds to the 'personality' of the voice. It wouldn't be attractive if it could perfectly imitate the human voice." But newer versions of Vocaloids, like Yamaha's most recent Vocaloid 4 that can "growl", have improved upon some of those imperfections. They're moving closer to sounding human than ever before. A pop star whose existence seems to depend on software updates runs the risk of becoming outdated. But Miku's more than just the technology. "[She] is sold, marketed and seen as a technological breakthrough," says designer Fineshriber. "But it's the culture surrounding her that's unique....I hope people can come together and use this as a way to understand each other's cultures."